Use your local library or the Internet to find out about grandparents in your culture and also in other cultures. For younger children, you can find the facts and share what you learn. For older children, you can help them find the facts and read all about it. Talk with your child about how his grandparents are alike and different from what you are learning about other cultures. 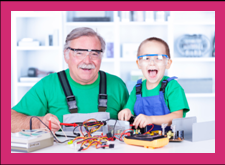 Arrange for your child to share what he learned with his own grandparents, or if that is not possible with some older relatives, friends, or neighbors that are like grandparents to him. This entry was posted in Activities and tagged fun and games, grandparents. Bookmark the permalink.